When the Cold War ended in the late 1980s after two generations of nuclear/geopolitical stalemate, Americans heaved a sigh of relief, exulted in the triumph of the free market, the end of history, the new unipolar world, and American exceptionalism. Silly us. Now that we're embroiled in a brand-new culture clash with Islamic fundamentalists, the military bases decommissioned under Bush One and Clinton take on a poignant air. San Francisco Bay has, of course, been ringed with fortifications for a good portion of its history: Fort Point, beneath the Golden Gate Bridge stands as a reminder. So do the bunkers erected during World War II in San Francisco and Marin County, across the bridge, against the threat of a possible Japanese invasion. Now abandoned and crumbling, these concrete fortifications, haunted by tourists and teenagers, dot the scenic shorelines of the Golden Gate Recreation Area. Painter Michael Hall discovered them during a residency at Marin County's Headlands, and was intrigued with the contrast between their current graffiti-covered dilapidation and their proud military history. In an age of preservation, and with the WWII generation vanishing, their neglect seems odd, but Hall's eight oils, which combine a photographic level of detail with satisfying painting chops, preserve them in all their ambiguity, a bit like Piranesi's engravings of Roman ruins or Atget's photos of vanishing Belle Époque Paris. Cropped to fill the frame, the structures exude stalwart forthrightness rather than Romantic pathos. It's reclamation, not declamation. Old vets would probably like larger works like "Guardpost, WR-H88," Watchtower, FB-BA-PB," "BES," "Battery Bluff," "BD-FF," and the two smaller hatchway paintings, "Entrance Square" and "Entrance Circle," as much as we civilians do (vicariously). Hall's sculpture, "Surrogate," made of lumber, concrete, and sod, and emitting the recorded sounds of wind, surf and birds, is Post-minimalism invested with history. 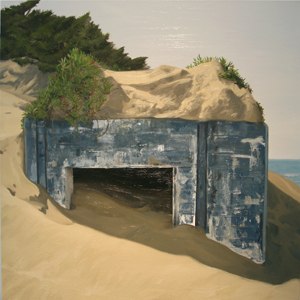 The recent contretemps over showing fine art - i.e., the Donald Fisher Collection, which found a good home downtown at the San Francisco Museum of Modern Art-at the post-military Presidio (now part of GGNRA) raises an obvious question: why not exhibit "Reclamation" at the Presidio Army Museum?